There was no exchange of cash or credit card swipes at the Marc Jacob's pop-up tweet shop this New York Fashion Week. The currency of choice was social. And, for the brand, this strategy is what they needed to engage with fans and generate buzz for Daisy, one of their best selling fragrances of all times. Produced by Mash+Studio and Native LDN, with event planning by Lionesque Group, the go-to pop-up architects, the SoHo shop smelled of the sparking floral fragrance which helped draw in this young, fashionable crowd. With a photo booth that included a backdrop built like a field of daisies, drink and manicure stations along with daisy props and artwork by Langley Fox, there was plenty social stimuli for fans. 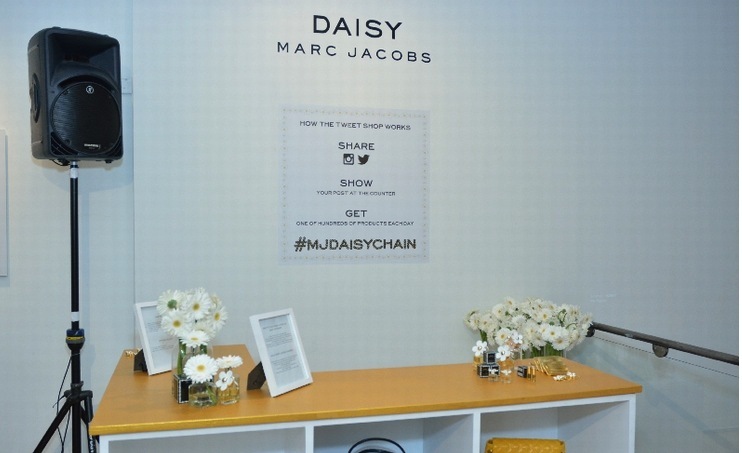 Users had to include the hashtag #MJDaisyChain to receive a promotional prize and their message was projected on a wall through a live feed. There was also a selfie challenge, which couldn't be more appropriate for this target customer that allowed participants to win bigger items like a Marc by Marc Jacobs iPad case or sunglasses. Florent Canepa, PR Director at Coty told us that the idea of the shop came about because they wanted to create an immersive way to thank fans for their support of Daisy which has organically grown over the years. By keeping an eye on social, they noticed that fans were interacting with the brand by taking beautiful staged shots, sketching images and using the hashtag. This is an interesting time for brands. Historically, promotional giveaways and brand experiences have been one-way and also fleeting. Now, brands can control the conversation while also leveraging and fostering a two-way conversation with customers. The benefit also includes intimate qualitative market research while incentivize them at the same time.